You think you’re an elite traveler with your Diamond status, your First Class Lounge access and such? A newly opened private terminal at Los Angeles International Airport has just raised the bar a lot higher– for those who can afford it. It’s not just for passengers flying on private jets– it’s for passengers traveling in first or business class on commercial flights, too. In an era of rising inequality, this place is even more one-percenter exclusive than British Airways’ new “millionaire’s door” at London Heathrow. 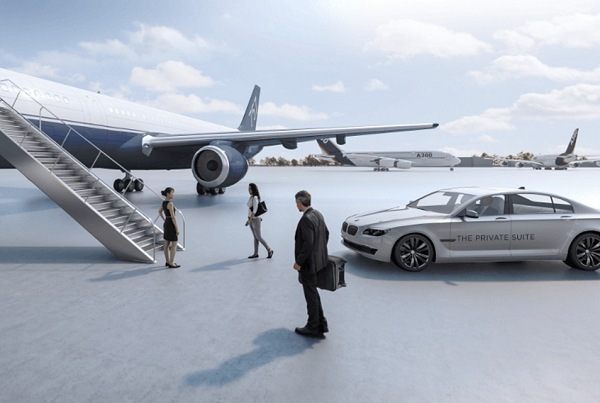 Departing customers get to hang out before their flight in one of the facility’s posh private suites, each equipped with a private bathroom, food service pantry, two-person daybed, several plush chairs, and a view of the runway. Users never set foot in the regular terminals, even for security screening, because The Private Suite has its own TSA checkpoint just for its customers. Luggage? Don’t even think about it—they take care of it for you. And when it’s time to board, a Private Suite employee drives you across the tarmac to your commercial flight in a BMW 7 Series sedan. The process works in reverse for arriving passengers.